KUAL LUMPUR, Malaysia (AP) — The murder of North Korean leader Kim Jong Un’s estranged half brother at an airport in Malaysia was brazen, intricately orchestrated and, thanks to scores of security cameras, witnessed by millions around the world. The real masterminds behind the killing, however, may never be brought to justice. The murder charge was dropped against an Indonesian woman, who was freed last month. Her co-defendant, a Vietnamese woman who is the only suspect in custody, pleaded guilty — not to murder, but to the lesser charge of using a deadly weapon to cause injury — and will be freed as early as next month. Her guilty plea and sentencing on Monday concluded more than two years of legal proceedings. But it cleared up none of the mystery. Here’s a look back at the crime, the missing masterminds and the ending. On Feb. 13, 2017, when Kim Jong Nam appeared at a check-in counter at a Kuala Lumpur airport terminal, he was jumped by two women who smeared something on his face. He soon began to feel ill, found his way to a medical station and was taken by ambulance to a hospital. He was dead within a matter of hours. The women — Indonesian Siti Aisyah and Doan Thi Huong of Vietnam — were arrested soon afterward. Huong was seen on security video wearing a T-shirt emblazoned with “LOL” across the chest. The video, and video of the chubby, blue jean-clad victim staggering around before his death, went viral. From the start, this was obviously no ordinary crime. Aisyah and Huong were accused of using VX nerve agent, a poison developed for military use, and the victim was the eldest son of the late North Korean leader Kim Jong Il, and half brother of current leader Kim Jong Un. For a time, Kim Jong Nam had been seen, at least by outside experts, as a potential heir to the country’s leadership. But he was caught, and humiliated, trying to enter Japan in 1998 to visit Tokyo Disneyland. He ended up in de facto exile, spending most of his time in Macau, a Chinese territory famous for its casinos. By the time of his death, he wasn’t part of the North Korean political scene. But his freedom to reside in Macau indicated he had some Chinese support. It’s possible he was seen by some as a viable replacement if Kim Jong Un were ever to be removed from power. The same group is believed to be behind an attack on the North Korean Embassy in Madrid last month in which 10 people allegedly shackled and gagged embassy staff before escaping with computers, hard drives and documents. Malaysian officials have never officially accused North Korea of involvement in Kim’s death. North Korea has denied any involvement. But prosecutors made it clear throughout the trial they suspected a North Korean connection. Four North Korean suspects were seen on airport security video discarding their belongings and changing their clothing after the attack. The North Korean Embassy has also been implicated, with an embassy official helping obtain flights out of Malaysia for the four men, and using the name of one of its citizens to buy a car that took the suspects to the airport. At Malaysia’s request, Interpol issued a “red notice” for the four North Koreans wanted in connection with the killing. Investigators said the North Korean suspects met the women at the airport and were believed to have provided them with the VX nerve agent used in the murder. The North Koreans are suspected of scouting and training the women, who say they thought they were taking part in a candid camera-style prank show for television. Malaysian police believe the North Korean suspects flew out of the country the day of the killing and returned to Pyongyang. 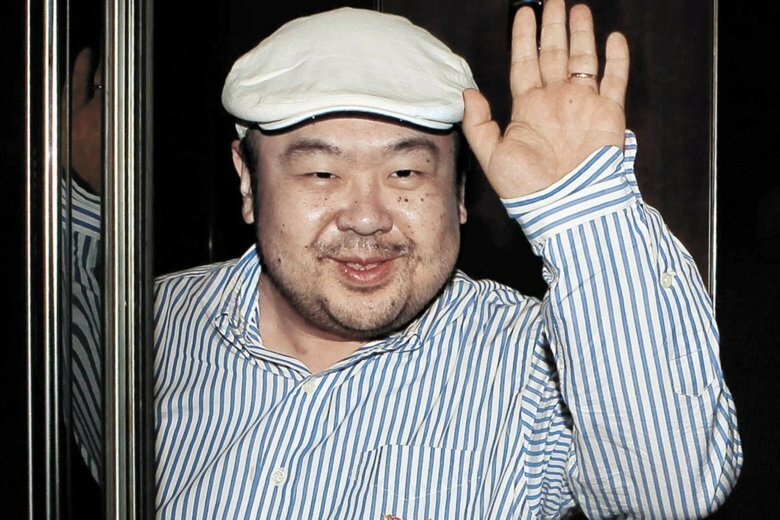 Investigations into Kim’s death led to a diplomatic spat between Malaysia and North Korea. Malaysia scrapped visa-free entry for North Koreans and expelled North Korean Ambassador Kang Chol after he rejected Malaysia’s investigation and insisted the victim was an ordinary citizen who died of a heart attack. Kang Chol also accused Kuala Lumpur of colluding with outside forces to defame North Korea. North Korea then banned Malaysians in its country from leaving, entrapping three diplomats and six of their family members. The nine Malaysians were only allowed to fly back after Malaysia released Kim’s body to North Korea and allowed the North Koreans to leave, including an embassy official and a North Korean Air Koryo employee wanted by police for questioning over Kim’s death. Following last year’s summit between President Donald Trump and Kim Jong Un in Singapore, Malaysia’s government has said it may re-establish ties with North Korea and reopen its embassy in Pyongyang. With the North Korean suspects missing, the two women were left to face the charges. After some high-level lobbying by Indonesia’s government, the Malaysian attorney general decided to drop the murder case against Aisyah on March 11. Aisyah, 26, cried and hugged her Vietnamese co-defendant before leaving the courtroom. She was driven away in an Indonesian Embassy car and then flown back to Jakarta, where she thanked the president and other officials for their help. Huong, 30, also sought to be released after Aisyah was freed, but prosecutors rejected her request. Vietnamese officials in the courtroom cheered when the decision was announced. As she was being escorted out of the court building, Huong shouted to reporters: “It’s very good. I love you.” She told reporters earlier that she wants to “sing and act” when she returns to Vietnam. Talmadge, the AP’s Pyongyang bureau chief, contributed to this report from Tokyo.